As pets age, many of them develop osteoarthritis. Some pets are otherwise very healthy but have a compromised quality of life due to the pain from this condition. Medications to treat the joint inflammation and resulting pain can provide relief but sometimes carry unwanted risks and side effects. We are therefore happy to offer an alternative treatment for families which is affordable and non-invasive. Laser Therapy is an FDA-cleared modality that reduces inflammation and alleviates pain. Treatments are performed in the hospital and only take a few minutes. Most patients relax and even enjoy the treatments, as they are soothing for achy joints. Some animals show signs of improvement after one treatment and even chronic patients often appear more comfortable after 3-5 visits. We have been offering this therapy as a primary or adjunct treatment for osteoarthritis at Courtenay Animal Hospital for several years and have had very good results! 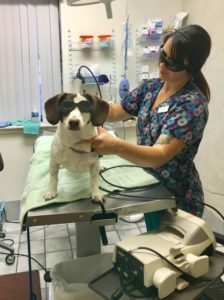 Laser therapy has also been used to treat non-healing wounds, lick granulomas, post-operative incisions, and other sites of chronic inflammation including ear infections and urinary tract disease. While we have less personal experience treating such conditions with laser therapy, it is a promising option for the future as we integrate alternative therapies with our traditional medical practices.